Continuing in my dosa series next up is Rava Dosa. The crisp and crunchy dosa variety is another very popular south Indian breakfast item. Traditionally it is made with Sooji (Cream of wheat), rice flour and maida (all purpose flour). 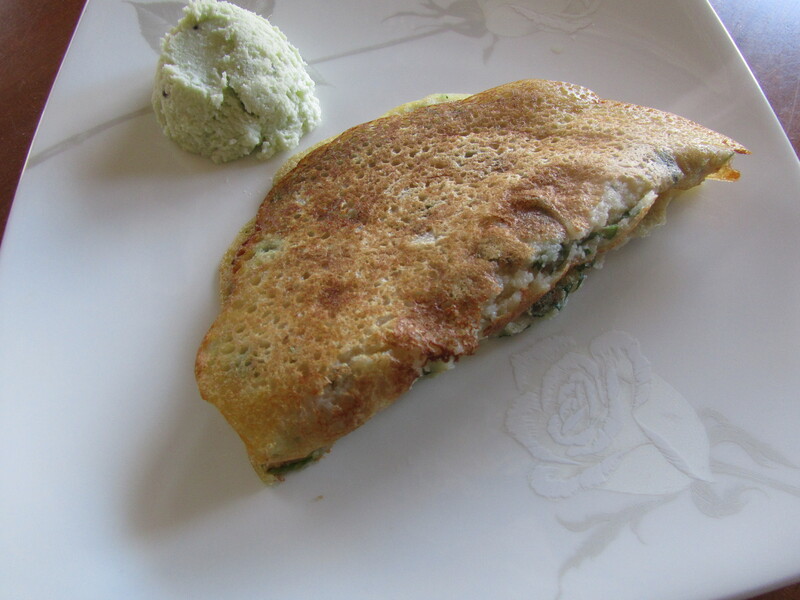 In this healthier version, I have recreated the rava dosa, using brown rice flour and whole wheat flour. If you are waking up on a Sunday morning and wondering what easy, fast and delicious breakfast you can make then look no further. Provided of course you have the ingredients at hand. With 30 minutes preparation time and as little as three ingredients this is one healthy breakfast to jumpstart a slow Sunday. 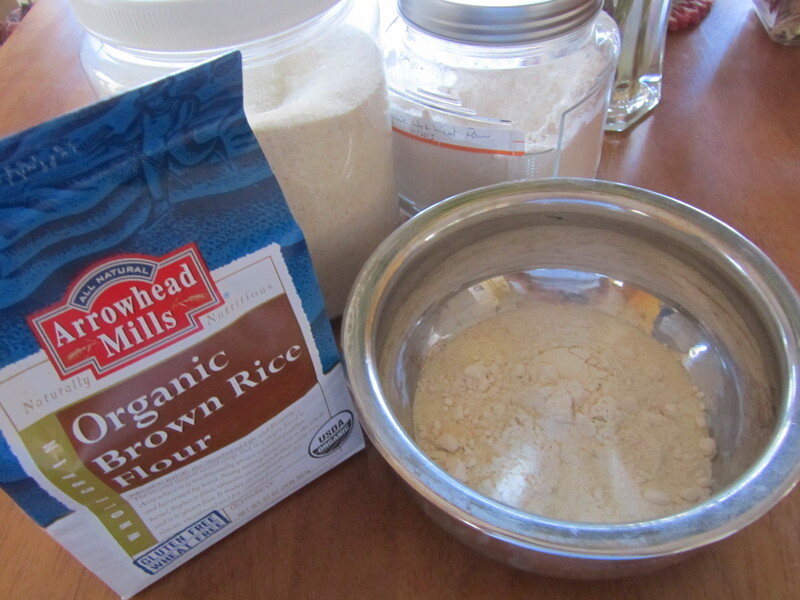 Mix all three flour ingredients in a large bowl in approximately 2 cups of water. Use water as needed to make batter that is smooth flowing. Add salt and mix well. Set aside for 30 minutes. When ready to make the rava dosas, heat a flat pan on medium flame. Grease well with a little oil. 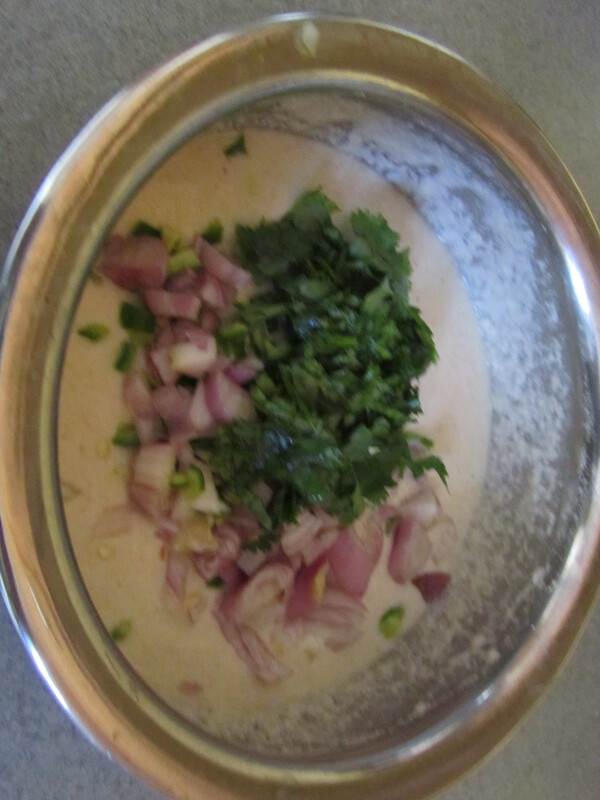 Mix in cilantro, onions and jalapeno into the batter. When the pan is sufficiently hot, pour batter onto the pan from a few inches above. Don’t use a spatula or spoon to even out the batter. Don’t worry about the shape of this one. This dosa is usually full of holes and comes out crispy and crunchy.The more holes the more crispy and crunchier the dosa. Add 1-2 tsp oil around the edges and cook until golden brown. Flip and cook other side adding oil as needed until cooked. This is so good, you will want to eat the hot rava dosa straight out of the pan! It can be eaten as is or you can serve it hot with chutney (see Tomato, coconut or peanut) and sambhar on the side. Previous PostSuper easy tomato chutneyNext PostWhat’s in my spice box? The recipe looks delicious. Aren’t all dosas supposed to ferment? I am wondering how you get the holes without yogurt or other things that would have caused fermentation? 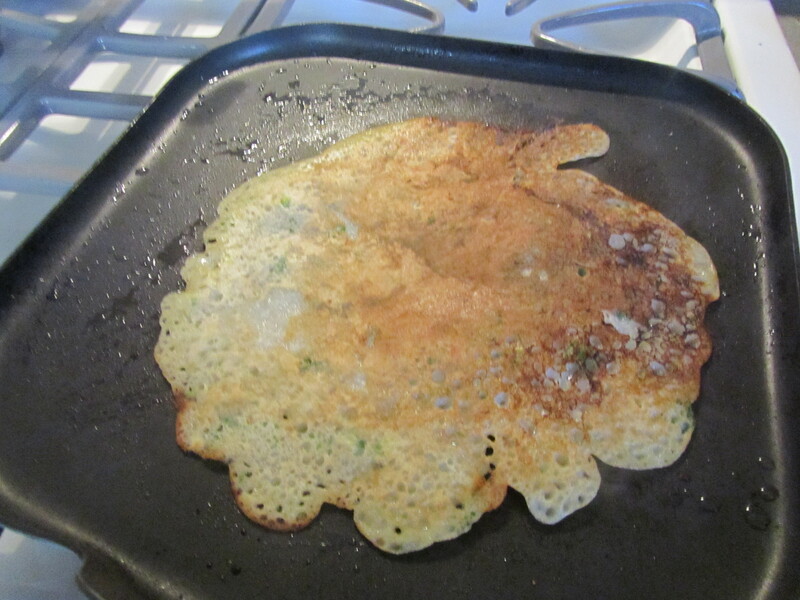 This is an instant dosa variety and hence does not need fermentation. I think the holes are formed because of the batter composition. I tried this recipe. First one stuck to the pan and came out in small pieces. Second one came out quite good. Key is to have pan super hot.